It saddens me that I am not very capable of painting my girls' nails. It's such a fun thing to do with your little toddler or preschooler. They get so excited to have pretty nails. But it's not me who gets to do it. Maybe I will give it a try one day and see how it goes. I guess the neatness factor isn't so important at this young age! Anyway, this is kind of a random subject I know, But it just hit home today. I try not to look too far into the future. I like to take one day at a time, But I can't help thinking about when they get into make up. I'm kind of screwed at that point. I should not be worried about thi s, With a four and a half year old and a two year old. But how can you not think about it a little bit? OK, so the above was written last night. I guess it was kind of a "feeling sorry for myself" moment. I am leaving it here because I believe in being genuine and I also think that others can relate to some of the same issues. I am not one of those "whoa is me" types of people. But if I'm going to do a blog and be completely honest then I'm going to write about various topics and from various perspectives based on my mood at the time. I pride myself on staying pretty optimistic. But I guess we all have our moments! I know that my kids will not suffer from having a mom with a visual impairment. Things will just be a little different for them. And mom I know you're reading this so let me just say thank you very much for the spa treatment yesterday. 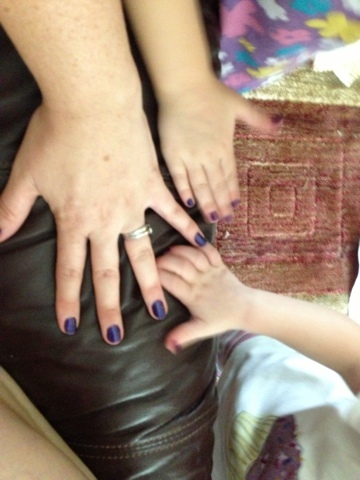 We all love our purple fingernails and toenails! :-) And thank you Jessamyn for the beautiful purple polish !! My heart is broken right now. Doing your nsils is fun for me. But I would much rather watch you do the girls nails. Love you, Sweetheart. Makayla just started with the make up stuff. She learned everything from her friends and no matter what I tell her, she does her own thing. They have to learn for themselves and would choose to do it all even if you could apply it for them. Your girls are not gonna miss a thing and will be fine and beautiful. Sad for you and your heartache. I pray daily for a cure for all of us. Until then, try not to sweat the small stuff. Easy fro me to say as I have been a basketcase for months now. :)You are the best mom your girls could ask for.